Maurice Canning Wilks ARHA, RUA (1910 -1984) was born in Belfast, N. Ireland. Maurice Wilks attended evening classes in drawing and painting at the Belfast School of Art but won a full place there by winning the Dunville scholarship. He was only 19 when he first exhibited at the Royal Hibernian Academy. During the next half century (1933-83), he was to show 35 works at the RHA, most of them landscape paintings, and was elected an associate member. 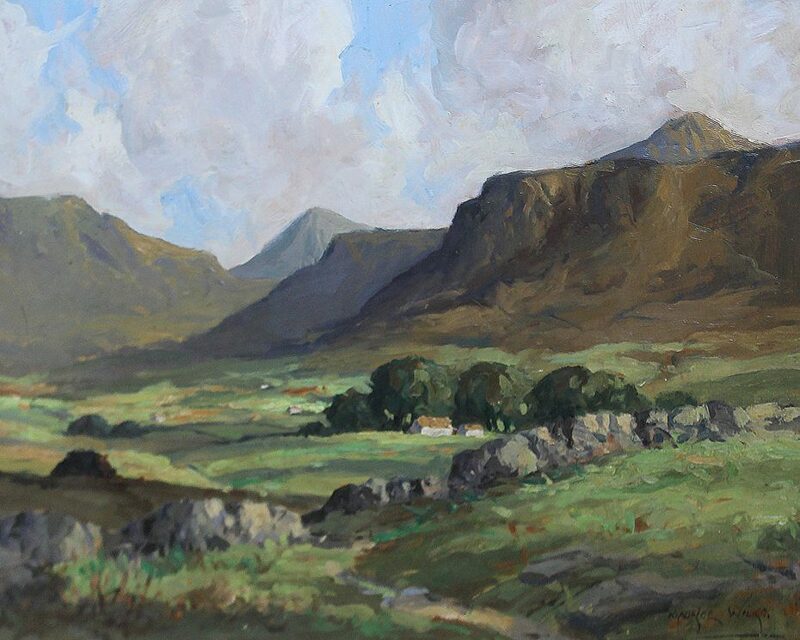 An exhibitor with the newly formed Ulster Academy of Arts, he was duly elected an associate member in 1935 and in later life was elected a full member. In 1946, Wilks exhibited several times at the Victor Waddington Galleries in Dublin. During the 1950s and 1960s, he exhibited mainly in Northern Ireland and North America, with solo exhibitions in Montreal and Boston, and in shows at Anderson and McAuley’s, and at Magee Gallery in Belfast. Towards the end of his career the Walker Art Gallery, in County Derry, also displayed his work. Wilks’ artworks were also represented at the inaugural meeting of the Ulster Watercolour Society in 1977, his last year for exhibiting at the RUA.